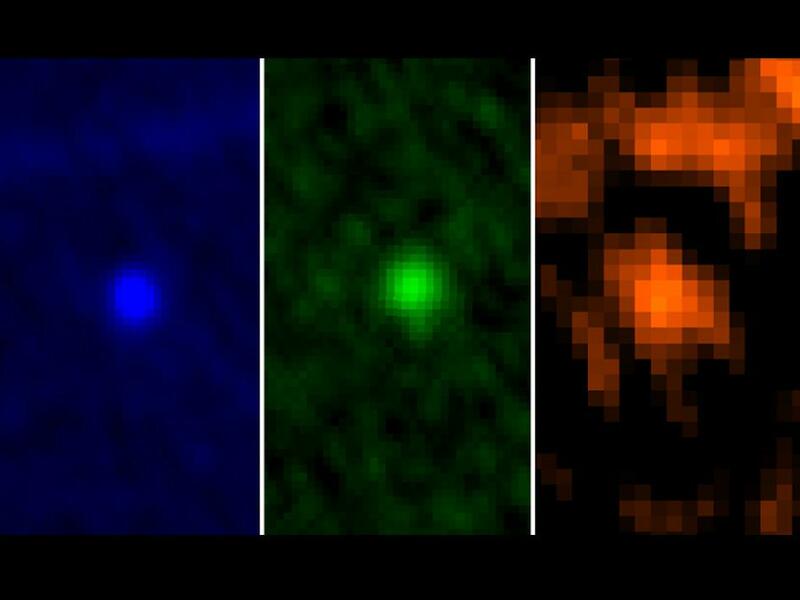 Images of Apophis captured by the Herschel telescope on Jan 5-6 at wavelengths of 70, 100, and 160 microns from left to right (Credits: ESA). The asteroid Apophis has made yet another pass of planet Earth, this one visible only through a high powered telescope. The passage has spurred interest mostly for a could-have-been: the asteroid was once thought to have a 2.7% chance of impacting Earth in 2029. Improved observation resolution has now ruled out such a collision and it is expected that data gathered from this orbit will allow experts to rule out a 2036 collision as well, although we can still expect a very close brush as Apophis passes a record breaking 29,450 km above Earth’s surface. It’s a good thing Apophis won’t be landing any time soon: NASA has recently determined that the asteroid is much larger than previously thought – 325m in diameter instead of 270m. Quite big enough to do significant damage. Not an astronomer, just a microscpist/image analyst/Physics and tech.background, but the combination of statistical analysis (without error bars), dark object, unknown interior composition, ccd imaging, …and recent growth of 20-30% in approximate diameter(…and how far away was it at that spectral imaging distance in earths atmosphere) gives me an uneasy feeling about the confidence level that we know anything except , “we have seen it and it didn’t hit us before”. The predictions seem to be very positive about a ‘miss’. Make us feel better. Show us the data, the fit, the math? Too complicated? At least a reference two or more published points of view. Also, more time lapse graphics with metrology. Apophis must appear increasingly large and better defined as we approach “flyby”, especially this close in time. Seems that this would have very good public appeal. This would be very interesting, though somewhere it was mentioned Apophis is in the daytime sky(at the observatories, I assume). Can we get more images from other international observatories? Thanks for your interest, Jeff! I think you might want to take a look at JPL’s NEA catalogue. They keep track of sightings, rate impact collisions, and determine impact probabilities there: http://neo.jpl.nasa.gov/risk/a99942.html The bottom line is that they now consider the cumulative probability of collision to be 7.4×10^-6, but they also split this out by year of passage if you are interested.